Canonical has just launched it streamlined verison of its Ubuntu Linux, designed for speed and tragetted at Netbooks and touch screen devices. The new Unity desktop has been redesigned with the main interface dock down the left hand side making it fast and easy to access preferred applications, such as the browsers and mail, while removing screen elements that are rarely used in mobile and netbook computing. Canonical has also released a Ubuntu Light version of Ubuntu which is based on Unity and intended for the dual-boot ‘instant-web’ market. 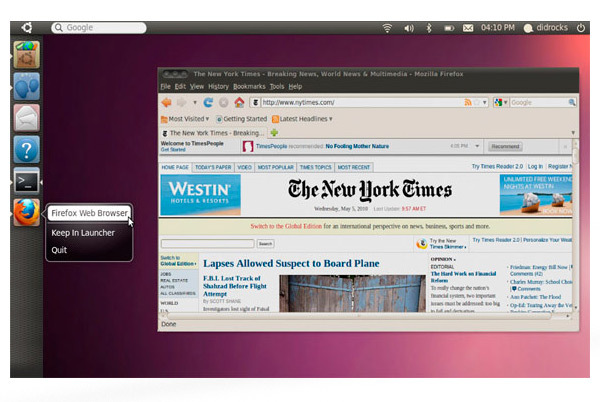 This new version, is more like a thin version of Ubuntu and features chat, IM, browser and media player applications. It is predominantly aimed at computer manufacturers for an ‘instant-web’ experience that complements Windows on consumer PCs. Unity will be released in October 2010 but is already available to developers to building applications and test its functionality.